Tarakihi are caught by commercial vessels in all areas of New Zealand from the Three Kings Islands in the north to Stewart Island in the south. The major fishing grounds are west and east Northland (QMA 1), the western Bay of Plenty to Cape Turnagain (QMAs 1 and 2), Cook Strait to the Canterbury Bight (mainly QMA 3), and Jackson Head to Cape Foulwind (QMA 7). The main fishing method is trawling. The major target trawl fisheries occur at depths of 100–200 m and tarakihi are taken as a bycatch at other depths as well. Around the North Islands 70–80% of the tarakihi catch is targeted. 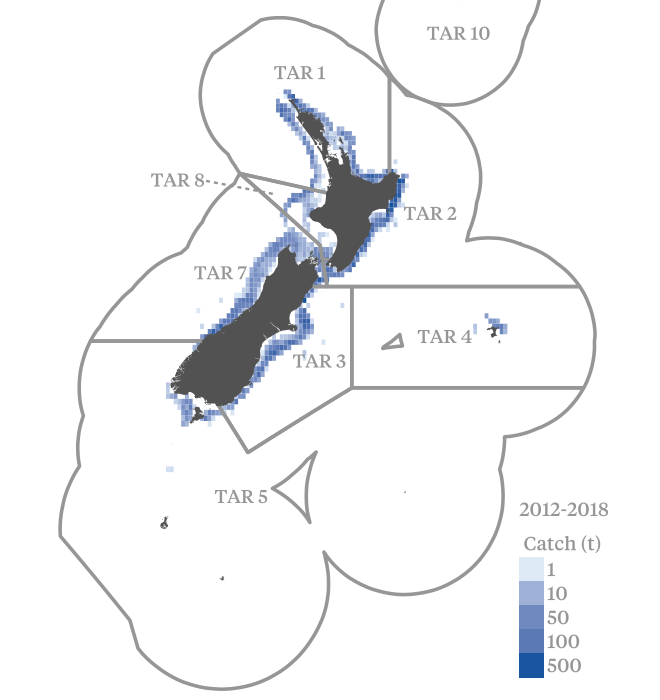 Around the South Island only about 30% of the tarakihi catch is targeted; with much of the remainder reported as bycatch in target barracouta and red cod bottom trawl fisheries. There is a commercial minimum legal size set for all tarakihi stocks at 25 cm. Tarakihi is managed by the Ministry for Primary Industries using the Quota Management System (QMS). The risk assessment covers nearly 85% of all tarakihi caught commercially in New Zealand. The position of the TAR1 stock in relation to all reference points is unknown. The Ministry for Primary Industries report that the stock relationships between TAR 2 and TAR 3 are unclear. Data from the main fisheries reveal similarities in abundance trends and age composition and it is possible that the two areas represent a single tarakihi stock or, at a minimum, that there is substantial connectivity between the two areas. TAR 2 was most recently assessed in 2012 based on a standardised catch per unit effort (CPUE) series from the mixed target species bottom trawl fishery. The TAR 3 stock was most recently assessed in 2012. The Ministry concluded that the position of the TAR 2 and TAR 3 stock against target and soft limit reference points is unknown, but it is unlikely (<40%) the TAR 2 stock is below the hard limit. The TAR 7 stock was most recently assessed in 2014 using trawl survey biomass and standardised CPUE indices. The Ministry concluded the stock is unlikely (<40%) to be below the soft limit and very unlikely (<10%) to be below the hard limit. Accordingly, the stock is probably highly likely to be above the point of recruitment impairment and the available evidence suggests is probably fluctuating somewhere at or around a sustainable biomass. While there is no formal mathematical harvest control rule for these stocks, there is clearly a process in place to identify, examine and respond to issues of stock decline, and a suite of available tools to implement reductions in exploitation if needed. Action taken to reduce the catch limits in response to stock declines in several New Zealand fisheries provides evidence that the management system is willing to reduce exploitation as the point of recruitment impairment is approached. The position of several target stocks against reference points is not known, as is the probability that current catch or Total Allowable Commercial Catch will result in a decline in biomass below soft and hard limits. Target species (TAR 1) - Uncertain: The current position of the stock against reference points is unknown. It is not known whether the current catch or Total Allowable Commercial Catch (TACC) will cause the stock to fall below reference points. The next assessment of the stock is scheduled for 2018. Target species (TAR 2 & TAR 3) - Stable: The current position of the stocks against target and soft limit reference points is unknown, although it is unlikely to be below the hard limit. It is unlikely that the current catch or TACC will cause the stock to fall below the hard limit. The next assessment of the stock is scheduled for 2018. Target species (TAR 7) - Stable: The West Coast South Island trawl survey biomass index is higher than in 2007, when it was likely the stock was at or above 40% unfished biomass. Biomass is expected to stay steady over the next 3–5 years assuming current (2012/13) catch levels.